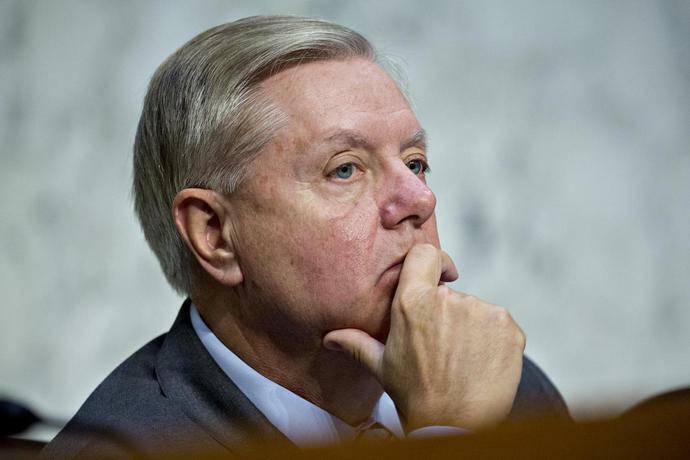 (Bloomberg) -- Republican Senator Lindsey Graham slammed Saudi Arabia's crown prince as a "wrecking ball" and "toxic" figure who he said was directly responsible for the disappearance and possible killing of journalist Jamal Khashoggi at the Saudi consulate in Istanbul. "I've been their biggest defender on the floor of the United States Senate," Graham, a South Carolina Republican, said of the Saudi leadership on "Fox and Friends" on Tuesday. "This guy is a wrecking ball. Nothing happens in Saudi Arabia without MBS knowing it," he added, using an acronym for Crown Prince Mohammed bin Salman. The comments from Graham -- an influential foreign policy hawk in Congress who frequently advises President Donald Trump -- were some of the harshest words yet made in public from a senior Republican on the Khashoggi disappearance and reflect rising concern in Washington that the crisis could seriously damage U.S.-Saudi ties. Graham said he'd support efforts to "sanction the hell out of Saudi Arabia." "He had this guy murdered in a consulate in Turkey and to expect me to ignore it, I feel used and abused," Graham continued. "I was on the floor every time defending Saudi Arabia because it's a good ally. There's a difference between a country and an individual. The MBS figure is to me toxic. He can never be a world leader on the world stage." The comments come as Secretary of State Michael Pompeo wraps up a day of meetings with the crown prince and other top Saudi officials after being dispatched to the country by Trump on Monday. Pompeo is expected to meet with Turkish authorities as well before returning to Washington this week. Pompeo and Prince Mohammed "agreed on the importance of a thorough, transparent, and timely investigation that provides answers" on Khashoggi's fate, State Department spokeswoman Heather Nauert said in a statement Tuesday. Saudi Arabia is considering saying that Khashoggi died in a botched interrogation, according to reports by CNN, the New York Times and the Wall Street Journal. That would dovetail with Trump's comments Monday that "rogue killers" could have been behind the likely killing of Khashoggi, speculation Graham sought to knock down. "This is not rogue killers," Graham said on Fox News radio. "This is a rogue crown prince," he added, calling Prince Mohammed "schizophrenic" and "unhinged." Graham's comments underscore the rapidly rising pressure in Congress for the administration to act against Saudi Arabia. Senate Majority Leader Mitch McConnell called the Khashoggi issue "extremely disturbing" and said some sort of action is likely after more facts become public. "Clearly we need to find out what happened before deciding what action should be taken," McConnell said Tuesday in an interview with Bloomberg News. "I can't imagine if what we think happened, that we would take no action." Trump has been more cautious in saying what could happen if the reports that the Saudi government was behind the disappearance are true. The president has said he would be reluctant to cancel multibillion-dollar arms sales to the kingdom out of concern the U.S. ally will turn to Russia or China instead. But a range of other punishments are under discussion within the administration, from downgrading diplomatic relations or sanctioning Saudi officials to following major U.S. companies in withdrawing officials from an investment conference in Riyadh this month. White House economic adviser Larry Kudlow warned Sunday of "stern action" by Trump if Saudi Arabia is found responsible for Khashoggi's disappearance. Saudi Arabia, the world's biggest oil exporter, said on Sunday it would retaliate against any punitive measures with even "stronger ones," according to a statement carried by the official Saudi Press Agency. Clean Harbors (CLH) Earnings Expected to Grow: Should You Buy?